Snake-Eagles are medium to large raptors that feed predominantly on snakes. There are three Snake-Eagles to be seen in Kruger. The Bateleur is one of the Park's most common raptors and is seen throughout Kruger. The Blackchested and Brown Snake-Eagles are more habitat specific - the former favours the Lebombo while the Brown is seen throughout central Kruger. They both have unfeathered lower legs. The eagle most associated with Kruger is probably the Bateleur. Its name derives from the French for acrobat or tightrope walker in reference to the way it juggles its wings from side to side as it flies low over the mixed woodlands throughout the Park. In Shangaan it is known as Ximongwe, the bird of the kings. In Zululand during the 19th century it was known as indlamadoda , the 'Eater of the Warriors' because of its habit of eating the bodies of warriors lying dead on the battlefield. It is the only eagle that deliberately makes a noise with its wings during courtship and territorial displays - in local folklore, this sound was the same as that of an assegai beating against a shield. The Bateleur has a reputation for bravery as it is not put off by dangerous prey. It regularly attacks and eats poisonous mambas and puffadders and on at least one occasion has taken a lion cub - wildlife photographer Peter Johnson once found the skull of a lion cub in a Bateleur's nest in Zimbabwe! According to Roberts VII there are an estimated 600 pairs in the Park and adjacent private reserves. They spend more time in the air than most other raptors, covering roughly 400km a day in search of carrion and live prey. They are very territorial. 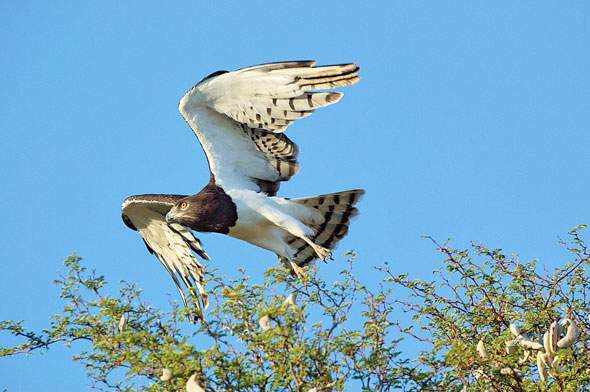 Bateleurs fly swiftly at speeds of between 50 and 80km/h at heights of about 100m above the tree canopy. They have extremely sharp eyes and is often the first bird at a mammal kill. Other birds often depend on its sharp beak to rip the carcass open. According to Newman, the Bateleur has the longest incubation period of any African eagle, with the egg hatching only after 55 days. Juvenile birds rely a lot on scavenging with up to 85% of their diet consisting of carrion. The older they get the more adept they become at hunting. See The Bird of War, Bateleur Images and Bateleur Mythology. Prominent, red, facial colouring; the head protrudes quite far in front of the wings; appears tailless in flight. Opportunistic feeder, going for carrion and live prey. About eighty percent of its live prey diet consists of mammals and birds and only eighteen percent of snakes and two percent of fish. The Brown Snake-Eagle is a fearless bird capable of killing and carrying off a two metre long snake. It usually hunts from a prominent perch in the woodlands, scanning the veld below for prey. When it sees a snake, it swoops down, seizes the reptile behind the head and crushes the spine with its talons and beak. If it loses the advantage of a surprise attack and the snake turns on it, the Brown Snake-Eagle will flap its wings to try and induce the snake to 'spend the last bullet in the chamber' before going in for the kill. It has developed heavily scaled legs to protect it against snakebite. Despite its efficiency in usually killing the snake before it has used its venom, the Brown Snake-Eagle does sometimes fall victim to its intended prey. There have been reports of Snake-Eagles being blinded by spitting cobras and of a python crushing one in its coils. But usually the Snake-Eagle wins, flying off with the dead snake in its talons. While the Brown Snake-Eagle will head for a perch to eat, the Black-chested Snake-Eagle will swallow the serpent on the wing. The snake is always swallowed head first. The tail end, which is the safest bit, is fed to the chicks. Ken Newman says a snake-eaglet will easily swallow a snake up to half a metre long. Very distinctive, piercing yellow eyes; prominent percher; legs are unfeathered and whitish; in flight appears brownish with barred tail. Predominantly snakes - puffadder, mamba, boomslang, grass snakes and other snakes; sometimes leguaans, chameleons and small mammals. Throughout the Park, particularly woodland areas; often seen around the granite koppies south of Skukuza. The Black-chested Snake-Eagle is often seen in pairs or small groups circling over the open savannah grassland and light woodland of eastern Kruger. Unlike the Brown Snake-Eagle, which hunts mostly from a perch, the Black-chested Snake-Eagle hunts from the wing, often soaring half a kilometre above the ground looking for reptilian movement in the veld. It is the only eagle to regularly hover. When it spots its prey, it descends in stages using its wings almost as a parachute before taking the final plunge. It will swoop on a snake, grabbing it in its talons and crush the body several times. The Black-chested Snake-Eagle will eat large snakes on the ground and fly off with smaller snakes, devouring them in the air. During courtship, mating pairs will often feed each other snakes in mid-air during breathtaking acrobatic displays. The Black-chested Snake-Eagle does not avoid venomous snakes, and appears to prefer smaller snakes than those fancied by the Brown Snake-Eagle, which has larger talons and a bigger beak. Dark upper parts, white underparts; large bright yellow eye; sometimes confused with Martial Eagle but does not have the black chest spots. In flight appears white with black head, barred secondary wings and a narrow barred tail. Mostly snakes - cobras, adders, boomslangs, grass snakes; also lizards, chameleons and occasionally small animals. Mostly seen over the eastern grasslands near the Lebombo, but recorded in light woodland throughout the Park, except for the south-western foothills.